Case Study: Fortescue Metals Group Limited (FMG) is a leading iron ore production and exploration company which operates in the Pilbara region of northern Western Australia. The company is the fourth-largest listed resources company in Australia, behind BHP Billiton Limited, Rio Tinto Limited and Woodside Petroleum Limited, and the largest pure-play iron ore mining company listed in Australia. The company currently has two primary production sites in operation, namely the Chichester Hub located in the Chichester Ranges in the Pilbara region comprising the Cloudbreak and Christmas Creek mining projects, and the Solomon Hub, which is located 120 kilometres west of the Chichester Hub and comprises the Firetail and Kings Valley mines. The company’s current operational objective is to achieve iron ore production of at least 155 million tonnes per annum (Mtpa), and it has undertaken an aggressive expansion program in the last decade in pursuit of this objective. The iron ore produced by the company’s mining operations is transported to their port facilities at Port Hedland and is shipped for spot market or futures contract trading in a number of overseas locations, but predominantly China. Fortescue Metals Group Limited’s largest shareholder is Mr. Andrew Forrest with a 33.32% ownership interest in the company’s ordinary share capital. Andrew Forrest was also the founder and former Chief Executive Officer (CEO) of the company, and is currently the Executive Chairperson of the Board of Directors. There are also a number of other key cornerstone shareholders, including international mining interests and consumers of iron ore resources. The company’s Board of Directors are seeking input from its Finance Division regarding the future strategic direction of the company. In March 2016, the company announced the signing of a Memorandum of Understanding (MoU) with the Brazil-listed Vale S.A, the world’s largest iron-ore mining company, to blend FMG’s lower grade iron ore with the Vale’s higher grade iron ore at Chinese ports to produce a premium iron ore blend designed to meet the long- term steel requirements of Chinese customers. One part of the MoU involved Vale S.A purchasing up to a 15% ownership interest in FMG on the sharemarket. However, updates in December 2016 suggested that this joint venture is unlikely to be operationalised any time in the near future. FMG is also in early stage discussions with Hancock Prospecting Pty. Ltd, in relation to taking an ownership interest in the newly-operationalised Roy Hill 1 iron ore project located in the Chichester Ranges area of the Pilbara near one of its current operations. This would potentially involve the purchase of up to a 25% share in the project, and the provision of access to its refining and railway infrastructure. Based on current financing arrangements and indicative valuations for the Roy Hill 1 project, the cost of purchasing this project share would be approximately $2.6 billion. Assume this analysis is being undertaken as at Monday 10th July 2017. Fortescue Metals Group Limited’s share price on Monday 10th July 2017 is $5.09 per share, and there are 3,113.798 million issued ordinary shares on this date. Fortescue Metals Group Limited is part of the Materials Sector based on the Global Industry Classification Standards (GICS), and its GICS Industry is Metals and Mining. Fortescue Metals Group Limited’s beta coefficient on July 10th 2017 is 0.89, compared to the beta coefficient for the overall industry of 1.04. The 5-year and 10-year Australian Government Bond yields are 2.258% and 2.784%, respectively, on July 10th 2017. The 1-year London Interbank Offered Rates (LIBOR) on June 30th 2016 and July 10th 2017 were 1.2302% and 1.465%, respectively. The S&P/ASX 200 Accumulation Index, including dividend and franking credit components, has provided an average annual return of 8.668% over the most-recent five- year calendar period to July 10th 2017. The Australian dollar to US dollar (AUD/USD) exchange rates on June 30th 2016 and July 10th 2017 were 0.7782 and 0.7602, respectively. Fortescue Metals Group Limited is subject to a corporate tax rate of 30%. Note that Vale S.A and Cliffs Natural Resources Inc. are pure-play iron ore mining firms, whereas BHP Billiton Limited and Rio Tinto Limited are diversified mining companies and iron ore mining is only a part of their overall mining activities. An analysis of the performance of Fortescue Metals Group Limited and the wider iron ore industry over the last five-year period at a minimum, and a risk assessment associated with an expansion of investment and activities in the iron ore sector in Australia. The determination of the current weighted average cost of capital (WACC) of Fortescue Metals Group Limited. A recommendation for how an investment in the Roy Hill 1 Project should be funded, taking account of the company’s current capital structure, recent financing actions, and the wider economic and financial environment. The due date for submission of this Case Study task is provided in the subject learning guide and on the subject LMS site. This Case Study will represent 30% of the final assessment for this subject and is to be submitted using the upload facility provided on the subject LMS site. This Case Study is an individual assessment task, and should be a maximum of 1,500 words, excluding any calculations, tables or other exhibits. The Case Study should be prepared in a professional manner and include informative and logical information to justify any decision-making and recommendation conclusions drawn. Relevant calculations employed should be fully explained and be understandable and interpretable by the reader, and any important assumptions made should be clearly stated. Any resources used, besides the Fortescue Metals Group Limited 2016, and prior year, annual report documents, should be appropriately identified and referenced. Executive Summary: The report discusses the business activities of FMG. It discusses the industry in which it operates and its performance over the past few years. The areas of risks have been identified and their potential impacts have been also assessed. The weighted average cost of capital of the company has been calculated. 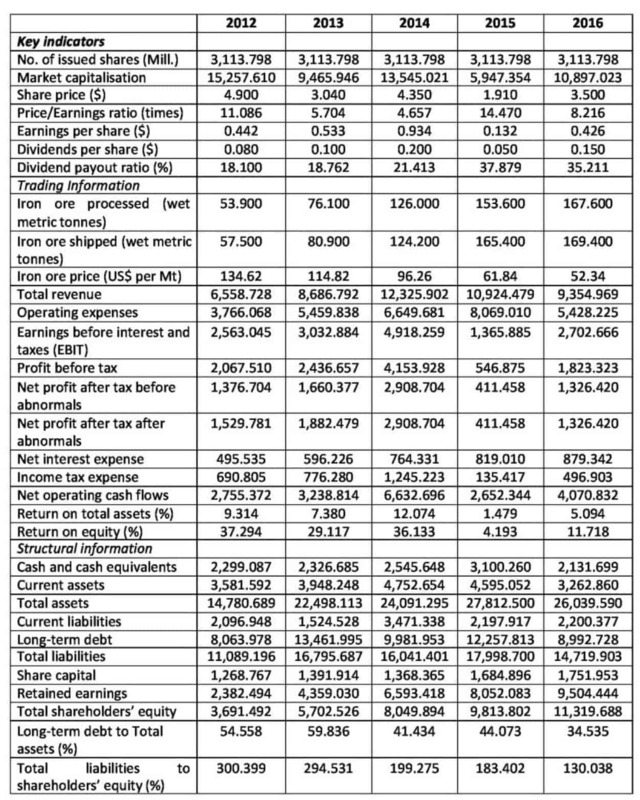 The valuation of the company has been done using the dividend discount model and peer comparison to compare it with the current market capitalization and identify the differences. Lastly, funding decision for a new project has been also recommended keeping in mind the current financial position of the company and the viability of the sources available for finance. Introduction: The growth of a company is dependent upon both financial and non-financial factors. Therefore, to assess the performance of a company it is vital that both these factors are considered. The valuation of a company is impacted by the internal factors like the working and performance of the company and the external factors like the industry in which it operates and the stock market factors. Analysis of Company and Industry Performance: The company is involved in the business of production and exploration of iron-ore in the northern region of Australia. The company is the fourth-largest resources company in the country and has two production sites. The reduction of the iron-ore price in the year 2016 resulted in decrease in the revenue of the company as compared to the year 2015. However, it can be witnessed that the company has strived to reduce its C1 costs on a continuing basis in last ten quarters which has drastically impacted the profit of the company. Therefore, even with decrease in the revenue in the year 2016 the company has witnessed an increase in the net profit of the company by 210%. The other important parameters of the company like mining, processing and shipments have witnessed an increase for the past five years. It implies that the business of the company in terms of volume has increased in these years even if the amount of revenue earned has reduced. The mining industry has experienced a fall in the prices for the past few years (IBIS World, 2018). The output of the industry has however increased in these years (IBIS World, 2018). The industry in Australia was meeting the high demand of iron-ore in the past years that had increased the world prices of the iron ore. However after mid-2014, the industry started experiencing oversupply which reduced the overall revenue of the companies in the industry irrespective of the increase in the volume. Major of the production of Fortescue was exported to China. Therefore, we can witness the decline in the revenue of the company after the year 2014. The sudden decline in revenue had also impacted profit in the year 2015 after which the company started gradually reducing its operating cost which improved the profitability of the company in the year 2016. Risk Assessment:The risk to which a company is exposed comprises of both the internal and external factors. We have conducted a SWOT Analysis in the given case to understand the strengths and weaknesses of the company and then relate it to the involved risks. Strengths – The Company is one of the pioneers in the industry. The company operates in north Western Australia where major of the iron ore is mined. The company has formed various committees to ensure efficient operations like risk management committee, taxation committee, employee safety committee. Weaknesses – The constant decline in the prices of the iron-ore due to oversupply is a matter of concern for the company. If the prices of the iron-ore decrease further they might have an adverse impact on the profitability of the company. Opportunities – The Company has been sufficient cash reserves therefore, it can consider investing in different ventures. The company has been in the industry for long and is a well-known entity therefore, it would have the benefit of brand image in the instances of acquisition and it would provide the company with a competitive edge. The company can consider investing in the ventures that would help in adding higher value to its company. For instance, if the company invests in ventures from which it is able to convert its low grade products into superior products it can sell them at a premium price and it would generate value for the company. Threats – The Company is involved in the industry where employee safety is given vital importance. It has to ensure that slavery is not practiced in any of the concerns which are in the supply chain of the company. Therefore, if instances of slavery are identified it would pose a threat to the company. The company supplies major of its extracts currently to China. If the demand of iron-ore decreases in China it would impact the business of the company. From the SWOT Analysis, it can be stated that the iron-ore industry is currently witnessing a reduction in oil prices which has to be compensated by curtailing the cost and increasing the volume of sale. The company has adopted both these measures. However, the company has to ensure that the safety of the workers is adequately met even with curtailed expenses otherwise it might have an adverse impact on the brand image of the company. It has to also ensure that the slavery is not practiced across the supply chain. Therefore, even after reducing the expenses it cannot curtail its expenditure related to these factors to a great extent. Note: The interest expense including the finance lease cost was provided together in the notes to the financial statements therefore, they have been considered as a whole for the computation of the after-tax cost of debt. Company Valuation: The company has been valued according to the various methods to compare the theoretical valuation of the company with the current market valuation. The growth of the dividends has remained in the past few years. The market is even witnessing oversupply of the iron-ore. Therefore, keeping in mind the above factors the perpetual growth of the company has been estimated at 5%. Peer Comparison:For the peer comparison we have only considered Vale S.A and Cliffs Natural Resources Inc. have been considered as they are involved only in the business of iron-ore mining. If the valuation as per Dividend Discount Model is observed, we can assess that the market share price of the company is less as compared to the share price that has been obtained by the application of Dividend Discount Model. One of the factors for such difference might be difference in the growth rate that has been applied in the given case as compared to the growth rate that is perceived by the market. If the peer comparison is observed, it can be assessed that the market capitalization to book value is less for FMG as compared to its competitors. The company is earning satisfactorily as can be observed in NPAT/Iron Ore Production ratio. However, the market capitalization to book value is less for the company as compared to its peers. It implies that the equity shares of the company are undervalued. Funding Decision:The company is considering funding the Roy Hill 1 Project. In the current scenario, the company can consider financing a mix of debt and equity. The iron-ore prices are declining currently therefore the margins of the future years are uncertain. If the entire funding is made through debt, it will increase the financial commitments by the interest amount. The cost of equity is higher than the cost of debt. However, the equity is currently under-valued in the market. Therefore, the company would be able to procure funds from equity at a lower price. In this manner, the company would be able to utilize all the available benefits in a balanced manner and funding the project through debt and equity mix would generate optimum benefit. Conclusion: The company is performing well and has the potential to cater to the current requirements of the company. It also has the potential to change its course in changing environment like curtailing costs in the instance of reduction in the iron-ore prices. However, the future of the industry and company depends upon the demand and supply of iron-ore in future. Since the company only deals in iron-ore products the economic impact on the product would have a direct impact on its revenue and margins.